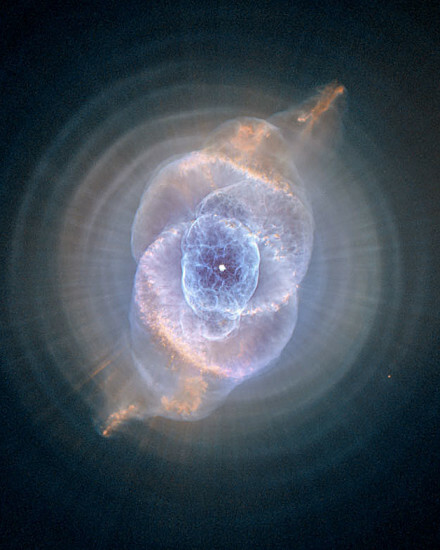 The Cat’s Eye nebula lies three thousand light-years from Earth across interstellar space. 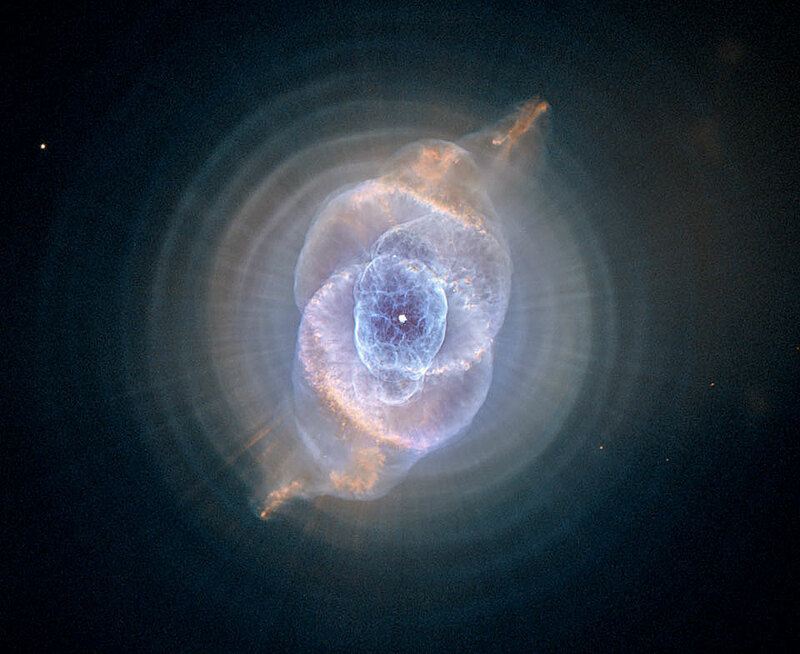 A classic planetary nebula, the Cat’s Eye (NGC 6543) represents a final, brief yet glorious phase in the life of a sun-like star. Seen so clearly in this digitally sharpened Hubble Space Telescope image, the truly cosmic eye is over half a light-year across. Of course, gazing into this Cat’s Eye, astronomers may well be seeing the fate of our sun, destined to enter its own planetary nebula phase of evolution … in about 5 billion years. About 13.7 billion years ago there was something (or nothing) and then there was everything. There are several different scientific hypotheses about the beginning of the universe. One involves an infinite series of expanding and contracting universes of which we are living in just one iteration. One involves a singularity beyond which our current models for space and time don’t hold and so to ask what came before is an irrelevant question… there was no such thing as time before. What we can agree on is that our universe is currently expanding rapidly away from an infinitesimally small point and has been for about 13.7 billion years. As all matter in existence hurtled away from that point, all the laws that govern our universe: gravity, electromagnetism, thermodynamics were formed along with all the matter that is the building blocks of everything we know: galaxies, asteroids, supernovas, white dwarfs, black holes, planets, and life. A hedgehog, an elephant, a tomato, a pool of water, and you are all made of the same basic elements as our sun and everything else burning in the night sky… all originated from the same tiny point. In order for those swirling hot clusters of matter spiraling at incredible speeds from a single point to eventually form into your complex visual and cognitive systems that are reading these words, a lot had to happen. Gasses condensed, gravity and energy from explosions pushed and pulled and manipulated that spiraling matter into clumps. The clumps, bound together by their own mass, settled into solar systems within galaxies; billions of galaxies, each containing millions of solar systems. Some of those solar systems provided the right elements and conditions to spark a process that eventually led to me writing these words and you reading them. That process is fueled by hydrogen, carbon, nitrogen, and oxygen. It can happen because our earth is the right mass in the right place to be in an orbit around the right kind of star (the sun), which allows it to be at the perfect temperature for liquid water, and an atmosphere filled with oxygen. It’s a process that through millions of years of trial and error developed life and eventually you. Every living thing on this small rock floating in an unfathomably immense universe derives its life energy from our sun*. Through the complex process of photosynthesis, plants do us fauna a solid favor. They intake solar energy and CO2 and they output oxygen and carbohydrates. Without this hard work by the flora of the world nothing else could survive. Every living animal that has ever inhabited earth from insects to rhinos, dinosaurs to shrimp, either gains energy directly from the sugars and carbohydrates that plants have harnessed from the sun or by eating another animal that has. Humans are no exception. Eating is our most elemental connection to the wonder and beauty of the universe. It’s something we all must do. Our food literally is us. Whether you’re a city dweller dining at fine restaurants 3 meals a day, living in a food desert eating nothing but fast food, or a hunter gatherer of Papua New Guinea, you’re connected to this cycle as much as every other living organism on planet earth. It’s what connects us to each other and to the cycle of life. Food-culture, food-technology, and food-industry have shaped almost every aspect of the world we live in. Yet most people in America have no idea where their food comes from, what went into making it, what it does for and to their bodies, or what the process does to the world around them. Answering these questions is what brought me into the forest with the Elk.